The province of Córdoba is bordered by two major mountain ranges to the north and south; the Sierra Morena and the Sierra Subbética. Dozens of little villages (pueblos) are nestled amongst the mountains and in the valley of the Guadalquivir River, connected with a network of bike trails and hiking trails. This makes Córdoba province a paradise for nature-lovers and outdoorsy folk, offering tons of opportunities for activities in the fresh country air. When my friend invited me to come rock climbing, I said yes without hesitation, jumping at the chance to explore the campo. It wasn’t until the morning of that I began to doubt my decision, seeing as the first and only time I rock climbed was when I was 11 years old and I hadn’t even made it up all the way because I was too scared. Free climbing like a boss. See how there is not rope above him? For those of you who have never climbed before, the object of the game is to scale the rock like a spider. You have to look for little holes or crevasses, sometimes only infinitesimal depressions, and somehow pull yourself up to the top (or wherever the rope ends.) The first climber free climbs up to the top of the route, attaching carabiners to hooks already nailed into the wall and stringing the rope through them. 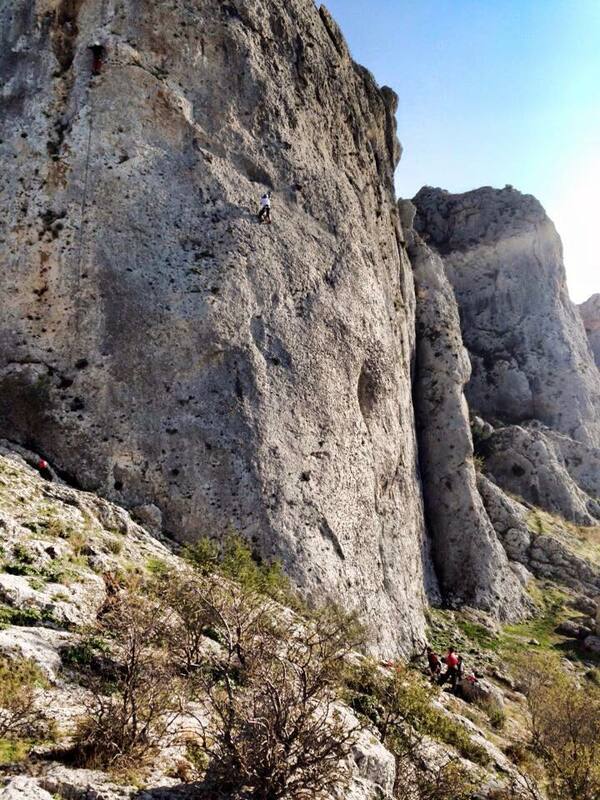 The free climber, unlike the climbers afterward, does not have the extra security of the rope at the top; they are protected from falling by the hooks placed along the route. Your life is in the hands of the person standing below, belaying (exerting tension) the rope through a little device that will automatically lock if the rope starts to slip too fast. So what does this mean? You are hanging from the side of the rock, saved from death by a simple machine and a rope. Naturally, I was feeling a little nervous. Besides the ropes (obviously), the most important parts of climbing equipment are the shoes. In Spanish, these are called “pies de gato,” or “cat’s feet.” Cool, right? These shoes are supposed to be a little tight and slightly curved at the point of the toe in order to give you traction on the rock. The key to climbing lies not in your arms, but in your feet. Chances are you don’t have enough upper body strength to drag yourself up the rock, so you must use your feet to propel yourself. Rock climbing is 60% mental; it’s a sport about trust. You must trust the ropes, trust the pies de gato, trust the person belaying you, and trust yourself. Without that, you will be paralyzed, unable to see the holes right before you. My first climb went horribly. It was the easiest route, but I kept getting stuck. “Uh… where do I go now?” I shouted down. Strangely, it wasn’t the height that worried me, but the idea that my foot was going to slip. Once you make it to the top, you have to come back down again. This is done by letting go of the wall and sitting back. Sounds pretty fun until you start thinking of all the ways you can go splat on the ground however-many-feet below. Everyone else, it turned out, was a natural. I happily watched my compatriots climbed to their hearts’ content, basking in the sunlight on my rock of (no)shame. I took a deep breath and started to climb. I was calm, I was steady, I made sure to carefully place my feet. When I reached the top, I looked out and saw the rolling hills criss-crossed with perfect rows of olive trees, little white towns wedged between the mountains, and a cloudless blue sky. I was on a high; both in altitude and on my own capability. Without trust and patience, rock climbing doesn’t work. For me, it shares these fundamental values with the act of traveling. The truth is, we never know what’s around the next corner, nor do we know what we should do. When you start to travel, you come into contact with many people. Without trust, it is impossible to form those relationships that make travel worthwhile. Those strangers and new friends who teach you something you didn’t even realize you needed to learn. Yet I don’t only mean trust individuals; we must trust the goodness in people and, more importantly, trust ourselves. See the tiny figure in white? That’s me. Photo courtesy of Adrienne Parent. Sometimes the best thing that you can do for yourself is to trust and then just let go. The view is pretty amazing from there. Previous Post ¿Truco o trato?